In my pre-Budget Commentary I asked whether the budget would meet the Coalition’s “small government” objective and suggested that the widely foreshadowed reductions in taxes would be limited because of the failure of the Coalition to effect a more substantive reduction in the budget deficit of $48.5 bn which Labor left it in 2013-14 and which was still at $23.6 bn (1.3 per cent of GDP) in the Mid-Year estimates for the current financial year (2017-18). I said that expert analysts predicted that the reductions would likely be limited to only about $8bn, which would be a reduction of only about 2 per cent of total taxes. In fact, the budget provides that, even after allowing for the much flaunted income tax cuts, total individual income tax payments are estimated to increase by no less than 6.0 % in 2018-19. For the four years to 2021 the estimate of the cuts is only $11.6 bn, which means that the tax cuts over those 4 years would only reduce the collection of income taxes by slightly more than 1 per cent from what they would otherwise be (for comparison, the estimate/projection of income taxes for the four years is now $954bn). The cuts in total taxation over the four years are fractionally more than $11.6bn (see below the Tax Outlook published in Budget Paper No 1 for 2018-19 which shows the small amount of policy decisions). The previous highest rate of total taxation was 24.3 per cent of GDP in each of 2004-05 and 2005-06 when the mining boom lifted incomes. The proposed maximum tax by Morrison is an arbitrary 23.9 per cent of GDP which, strangely, would allow for an increase in total taxes of 0.8% of GDP, or $17bn, between now and 2021-22. 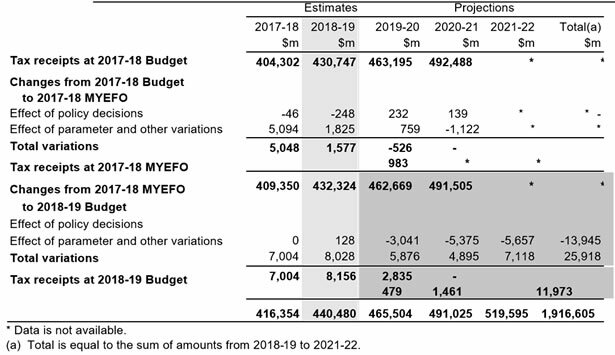 Table2 reconciles the 2018-19 Budget estimates of tax receipts with the 2017-18 Budget and the 2017-18 MYEFO estimates. Since the 2017-18 MYEFO, tax receipts, including new policy, have been revised up by $8.2 billion in 2018-19 and $12.0 billion over the four years to 2021-22. Excluding new policy, tax receipts have been revised up by $8.0 billion in 2018-19 and $25.9 billion over the four years to 2021-22. Net debt increased under the Labor government from 2009-10 to about 13 per cent of GDP in 2013-14 and an estimated 18.4 per cent in 2018-19. It is now estimated to fall to 14.7 per cent in 2021-22 but that depends on lowering spending and/or saving more from collections of taxes.